1,500(5) LP 36.7 550 79.5" 21.5" 21.75"
2,000(5) LP 49 650 82" 21.5" 27.75"
3,000(5) LP 73.5 760 86.5" 21.5" 33.75"
4,000(5) LP 98 880 89" 21.5" 39.75"
5,000(5) LP 122.5 1,120 96.5" 21.5" 49.75"
6,000(10) LP 147 1,100 89.62" 31.5" 33.75"
8,000(10) LP 196 1,280 95.62" 31.5" 39.75"
10,000(10) LP 245 1,600 102.62" 31.5" 49.75"
12,000(20) LP 294 2,250 107" 60.75" 33.75"
15,000(20) LP 367.4 2,500 110" 60.75" 39.75"
20,000(20) LP 489.9 3,080 117" 60.75" 49.75"
25,000(20) LP 630 3,800 126" 60.75" 61.75"
30,000(40) LP 734.8 5,400 143.63" 119.5" 39.75"
40,000(40) LP 979.8 6,350 147.63" 119.5" 49.75"
50,000(40) LP 1,224.7 7,800 153.63" 119.5" 61.75"
60,000(40) LP 1,469.7 9,400 158.63" 119.5" 70.75"
Model number indicates bushel per hour capacity. Number in ( ) indicates number of screens in Kleener. By-pass standard on all models except 700(4)LP. All dimensions approximate and subject to change. 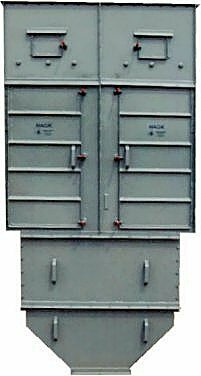 Magik Kleener for farm and commercial grain cleaning.